More weather BoM's in Oz | Watts Up With That? NOTE: There’s an error here. I misidentified the Laverton airport in the Google Earth Map. My bad. But I will say when I typed in Laverton Airport, thats what GE gave me. There are two Laverton Airports in Australia as it turns out. Yesterday I visited Tasmania’s Hobart weather station and found it surrounded by buildings and a collection of air conditioners. Today we have a complaint about another BoM weather station from a working scientist. The discontinuity with a step shown above is a bit of a puzzle. Perhaps the station was moved or the airport upgraded or both? The aerial photos at Google Earth are not of high enough quality to determine where the weather station actually is, and all of the lat/lon published at GISS and NCDC are very coarse. Perhaps somebody knows someone who lives in Laverton who can go to the airport and help us location the station. David Jones in regard to a comment I published in the Journal Biology Letters1. My comment discussed problems with an earlier publication2 that claimed a link between changes in butterfly emergence times and dangerous man made global warming around the Melbourne area. Dr Jones is the head of BOM’s Climate Monitoring and prediction unit within the National Climate Centre. I am a working geologist with a MPhil and a PhD candidate at the University of Newcastle. Dr Jones inquiries were restricted to discussion of the quality of weather station data used in the emergence study and my comment in which I called the quality of this data into question. In particular Dr Jones was concerned with assertions that BOM weather station Laverton (ID 87031) was potentially affected by the Urban Heat Island (UHI) effect. This effect has a significant impact on temperature and is derived from man-made changes in the energy balance in urban centres, to the point where sites that are affected are not useful for monitoring climate unless they are adjusted. The bias arises as a direct result of two different but associated processes. The first involves direct heating of the air surrounding an instrument from vehicle emissions, air-conditioning, industry etc. The second involves land surface changes that include changes over time due to human influence in albedo (change in vegetation for instance), thermal aerodynamic properties (buildings that change air flow around a site), hydrology (affects evaporation) and morphology of the surface. monitoring network. BOM currently does not adjust station records at Laverton for UHI. The population around the Laverton station has changed significantly since the station was first opened. ABS statistics indicate a population increase from 7853 in 1933 to over 132,000 in 2008. It is also clear from aerial photographs that there has been significant urban development around the station since its inception, with significant growth in residential development over the last three decades. In the course of my correspondence with Dr Jones it has become clear that no measurement has been made of the potential affect of UHI on Laverton’s temperature data. A study published in the Australian Meteorological Magazine3 used as evidence by Dr Jones merely assumed the station was “rural” but provided no proof to support this. Contradicting Dr Jones claims this study states: “It is possible that the measured Melbourne UHI is a slight underestimate, as measurements across the Urban-rural boundary were not continued far into the rural area.” I understand from Dr Jones that Laverton occurs near the end of the transect used in the study and hence lies inside the urban side of this boundary. Additionally this study determined a quantitative relationship between UHI and population for south east Australia. Using the equation furnished in this paper and ABS statistics, the UHI at Laverton can be calculated at 5.18 degrees over and above rural temperatures. Clearly on this basis Laverton cannot be considered a ‘rural’ site. anthropogenic activities”. The study does not attempt to quantify the effect. Dr Jones claims this study supports his assertion that Laverton is unaffected by UHI. It clearly does no such thing; it clearly implies the stations are indeed affected. It does not support Dr Jones’ claims. climate agency regards Laverton as an urban site with a population of 2.7 million for climate monitoring purposes5. In our discussion Dr Jones appeared unaware of this fact and suggested I contact NASA to determine why this might be the case. I find it astonishing that the head of BOM’s Climate Monitoring and Prediction unit would not be aware that NASA considers the Laverton site as urban for climate monitoring purposes. Even more astonishing is that on being informed of this he appears dis-interested in following this up further on behalf of the BOM, stating “I suggest you contact NASA GISS as to why they define a particular station as urban”. I would have thought this would have been a primary responsibility of Dr Jones and of the BOM. I would be happy to follow this up on BOM’s behalf in return for a fee for professional services. remarkable given the importance of Laverton to BOM’s network of High Quality stations. clear that BOM simply does not know how much UHI affects temperature at Laverton. I find this of great concern given the site is used as part of BOM’s climate monitoring network. A UHI of just 0.1 degree per decade at Laverton would significantly affect the station’s influence on regional trends. Indeed a UHI of just 0.1 degree per decade would mean Laverton would no longer be considered a “High Quality” site, ruling out its use for climate monitoring purposes. While this issue may seem a mute point, a disagreement between scientists, of little interest to you as the responsible Minister, I think you would agree that ensuring the accuracy of Australia’s network of meteorological instrumentation is of critical importance. If there are problems with BOM’s climate network it casts significant doubt on the ability of politicians to make responsible policy decisions. The apparent dis-interest in the issue shown by BOM is of concern and I bring it to your attention. As the Minister responsible, I request that you investigate further the issue of UHI at this key monitoring station. What is the affect of UHI on Laverton, and what is the impact of UHI on this key climate monitoring site? A complete transcript of the email correspondence between Dr Jones and myself is available at your request, should you require it. 3 Torok SJ, Morris CJG, Skinner C and Plummer N., 2001. Urban heat island features of SE Australian Towns. Australian Meteorological Magazine 50, 1-13.
the emergence study and my comment in which I called the quality of this data into question. around a site), hydrology (affects evaporation) and morphology of the surface. development over the last three decades. Laverton cannot be considered a ‘rural’ site. thing; it clearly implies the stations are indeed affected. It does not support Dr Jones’ claims. on Laverton, and what is the impact of UHI on this key climate monitoring site? at your request, should you require it. June 23, 2010 in UHI, Uncategorized, Weather_stations. That photo is Laverton WA the letter talks about Laverton Vic which is has gone from farm land to hevey industrial. The picture in the article is not the right Airport. Laverton Airport is at 37° 51′ 46.98 S 144° 44′ 47.66′ E. The Google image is pretty good, but I have not spotted a weather station yet. It is surrounded by housing and population. 25 years ago it was a rural setting with few houses. Now it is a suburb of Melbourne – U.H.I. anyone? Looks like some sort of mixup here. Wikipedia shows the population of Laverton, WA, Australia as 316 for the 2006 census. 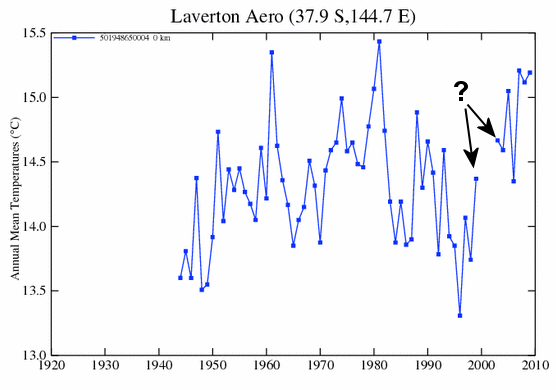 Also note that the Laverton Aero, NSW, is supposedly located across the continent, and not in WA, but NSW. Laverton, Victoria is on the western edge of Melbourne, in a relatively densely populated area. As Scott said, it seems you’re looking at Laverton, Western Australia. The GISS location names are the same, but the lat/long information is significantly different. Type the lat/longs into Google Earth and you’ll be taken to both Lavertons pretty quickly. Anthony, I think there has been a stuff up here. 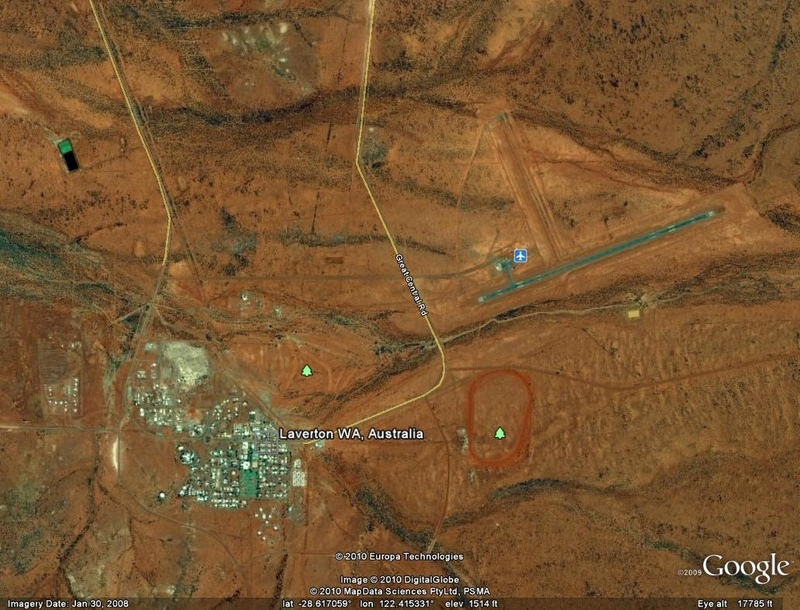 Laverton, Western Australia, shown in the Google Earth pic is at 28-37south, 122-24 east. But 2,200kms to the east is another Laverton, Victoria, almost in Melbourne, at 37-52 South, 144-45 East. Looking at the GISS table you posted up, the “?” and arrow point to the station in Melbourne where the population is possibly correct. Hope you are enjoying Australia, keep up the great work !! Anthony here is the location of the Laverton Victoia, weather station -37.856607,144.756696 but the Google pictures are a somewhat out of date. More urban development has taken place since. Anthony, thanks for the post but the photo shows the town of Laverton in West Australia. The Laverton of concern is in Victoria, on the eastern side other side of the continent, about 17 km SW of Melbourne’ CBD. The correct Lat/Long is: 37.9 S	144.7 E.
The met station at Laverton Aerodrome appears to be located at: S 37.856493°, E 144.756620°. It appears to be surrounded by grass land for some hundreds of meters. hmm, so we’re measuring something somewhere and it’s counting towards our global temp. 😐 We’re failing in both accuracy and precision! This should be shocking…..but its not. The big news about weather in Oz, is the political climate under today’s new PM. Julia Gillard’s ascendancy to power has been established by the very same people that pushed Rudd into abandoning the ETS (emissions trading). Will the ETS stay dead ? I was recently at Cape Willoughby on Kangaroo Island, south of Adelaide. There are no air conditioners or population centres nearby. I think it would make an excellent temperature reference if you can get the raw temperature measurements for it. I can send photos of it if you like. Anyone done a SIMPLE statistical analysis of this data? I highly DOUBT that with the number that would come forth as the Standard Deviation for this station, there would be ANY STATISTICALLY SIGNIFICANT CHANGE IN THE (BOGUS..WORTHLESS..IDIOTIC…without Relative Humidity…) “Average Temperature” during the observation time cited. I’ll be checking Laverton and other Vic sites in a couple of days- first I’ve got to get Tasmania up. Thank you for providing some alternative data to the AGW/CC nonsense that we are presently having to endure down under. The hype is still mass produced here, and is quite relentless. Kids shows, evening shows, and the news continue to have advertisements for “how you can prevent climate change”. Coming from the North western US where we just had our coldest and snowiest winter in a very long time, this kind of nonsense is hard to stomach. But it is relentless. — and is gravely to be regarded. Shows the Laverton RAF Weather station site on google earth, it looks good, apart from the build up of houses to the west/south and east of the aerodrome. Here’s the weather station in Bing maps. Embarking on a bit of a charm offensive, the Intergovernmental Panel on Climate Change just released the names of more than 800 scientists who have been selected to take part in writing its fifth assessment report on climate change, due out in 2014. .. Some 3,000 scientists were nominated to fill the positions, mostly by national committees. The panel did not say what criteria were used to whittle the number to 831. The full list of authors (links are here) includes some interesting newcomers to the panel’s process, like Daniel Nepstad of the Woods Hole Research Center, who was quoted in a Times article last year about Amazon deforestation, and Julian Allwood of Cambridge University, whom we interviewed about sustainable clothing. funny how the 800+ are trotted out hot on the heels of the “black list” nonsense. The actual siting is not the main issue. Although I don’t know how long the station has been at that particular site (I have sent BOM some hard earned dollars to get a copy of the station meta-data file, that should provide more information on the history). Of concern is the encroaching residential and industrial development and the fact that this station is just 17 kms from Melbourne’s CBD. In terms of population changes around the station I have posted a graph showing this at ABC NEWS WATCH. The Laverton area had a population increase from 7853 in 1933 to over 132,000 in 2008. The population doubled from 1990 to 2008. As much as people are so stupid that they do not remember what happened Two months ago, people are still so stupid as to what it will be like Two months from now. It will be near September and the evidence of leaves turning color for the Autumn will be in view. The kids will be getting ready for school again and soon thereafter the pumpkins will be covered with frost in October. Please don’t lose site of the season you are in the world. Laverton WA Station ID 12045 covers 1900-1970-mean max temp over this period is about 27.45 C.
Laverton AERO Station ID 12305 covers 1990-2010 with a mean temp of 26.8 C. Gross cooling of about 0.65 C – WUWT! Further to my post of 8:13pm above If the air photo shown in the link is indeed 1946 and I dont see any sign of an airport per sae, how do they have temperature data that goes 1943 to 2010? Giss now exclusively uses night light brightness for the entire world to determine whether a station should be adjusted. A value of 10 or less is now considered the same as what was formerly called rural and those stations don’t get adjusted. The highest brightness value for any of the stations in the Giss database is 186 for Montreal McGill. Giss shows Laverton Aero with a brightness value of 16. It gets adjusted. Surprise, surprise, the temperatures in most years become a few tenths higher after adjustment. If Laverton brightness was 10 or less it would be considered rural, left unadjusted, and possibly used in making adjustments to other non-rural stations. That usage is distance dependent. 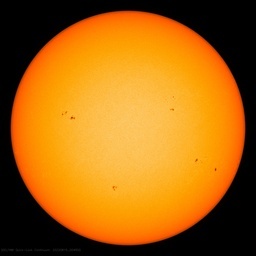 Changing from population to brightness has caused numerous stations to change classification. Seems to only have had a minor effect on annual anomaly values though. Of the 7364 stations in entire database 1037 have moved from rural to non-rural classification. 854 stations have moved from non-rural to rural classification. I’ve seen a few with actual populations of more than a million that are now considered rural. Lack of adequate electricity at night may be a reason. 70% of the database isn’t even generating data anymore, but they still figure in calculations for the years they do have data. If no runways in 1946 but Wiki reports the Australian Grand Prix race held on runways in 1948, there must have been some expansion in the interim. Also says airforce base was decommissioned in the early 1990s. In early 2007 the Victorian State Government gave approval for the land that was formally the Laverton airfield and runway to be developed into the new suburb of Williams Landing. Perhaps this information helps explain some of the peaks and troughs? what is the point of this WaPo blog post? no-one has responded. i’m not rightwing, centre right, or anything remotely related to the right, yet the MSM keep repeating this nonsense. Spring 2010 was officially the warmest on record both for Washington, D.C., locally and Earth as a whole. Deniers can bicker about how inconvenient it all is, how it may or may not be due to human interference, or how Al Gore is a Democrat so he couldn’t possibly be right, but the bottom line is that climate change is real, and it is upon us. But EU policymakers speaking in Brussels yesterday (22 June) cautioned that more research must be carried out to ascertain its impact more accurately. “From the scientific point of view, it is not that certain yet,” said Frank Raes, head of the climate change unit at the European Commission’s Joint Research Centre (JRC). The existence of both black and white aerosols, with warming and cooling impacts, makes it less straightforward to make a case for political action on black carbon, the speakers added…. Yeah, I hate to say it, but Anthony made a sloppy error by putting up the wrong photo (not that this has anything whatsoever to do with the letter). Now let’s “show them how it’s done” and make a transparent correction. Which is what I fully expected to see whether I mentioned it or not. Yes, I picked up the error with the station locations. I have done some research on 2 country stations, located in QLD. Both towns have populations of less than 1,500 people. Both stations show an UHI effect. It is possibly simply bad siting, but the effect is there. As I will be meeting Anthony shortly; I will show him my research and get his opinion. I will then look to a posting. It appears that the UHI appears even in small country towns. If this is the case it will throw into doubt all the adjustments to temperature data, made in the name of UHI effect. 1985 – 14.4, 1986 – 13.9, 1987 – 14.1, 1988 – 15.1, 1989 – 14.4, 1990 – 14.9, 1991 – 14.3, 1992 – 14.0, 1993 – 14.5, 1994 – 14.3, 1995 – 13.8, 1996 – 13.7, 1997 – 14.6, 1998 – 14.2, 1999 – 14.9, 2000 – 15.0, 2001 – 14.6, 2002 – 14.9, 2003 – 14.9, 2004 – 14.6, 2005 – 15.3, 2006 – 14.7, 2007 – 15.9, 2008 – 15.0, 2009 – 15.4. Somebody has lost the plot! Congratulations Marc on your letter to Minister Garrett. There is clearly a need for more sharp pencil work to be done on the readings from the BOM sites around Melbourne to qualify their validity as a basis for determining temperature trends. As a resident well within the Melbourne UHI affected area, I had a look at much of the readily available temperature data when studying the Brown Butterfly episode. Papers and other publications from both Melbourne and Monash Universities, all of which are readily available to Dr Jones, clearly show that Laverton is well within the boundary of the Melbourne UHI effect. The question is not a matter of whether, but of how much, and how much is critically important for sound decision making. Looking further afield, I could not find a site in Victoria that was quality controlled for accuracy, situated in a clearly definable rural area, and with a long enough record to be capable of establishing a statistically valid long term trend. I have concluded that the the claims made by the BOM about a long term temperature trend caused by humans are not very soundly based. There are too many likely errors in the data. “Yes, I picked up the error with the station locations…………. Dr. Spencer has shown that to be true. You can see his work right here at WUWT! He’s posted 2 or 3 times here regarding this issue. Hey! I just looked at a post from Oz-Land, and it says that all of a sudden Kevin Rudd is OUT??? Hmm well maybe they include the dingos, dingbats, wallabies, and kangaroos as people? Marc, slightly off topic, but is there any research done on the UHI of the Melbourne CBD? And are the figures”corrected” in any way. The AWS now reads much higher than surrounding areas in Southerly or SW winds due to buildings now covering the whole area. Ten days ago Melbourne CBD was the highest temp in Victoria, higher than Mildura by 1 degree which is some 600kms further North. Seems ridiculous to me that this could happen. Would be great to find out if any UHI factor is taken into account, but from what i know its disregarded by the BOM as it suits their obviously biased stance. Did it occur to you that the discontinuity in the temperature record might have something to do with the “two Lavertons” problem? If you can get fooled by them why not some lackey at GISS who’s never been down under?